I don’t know if anything puts me in the mood for seasonal/holiday baking like M&Ms. Every holiday and season has an M&M(That’s some pretty good marketing…After all, it’s the same candy, just in attention grabbing colors!) 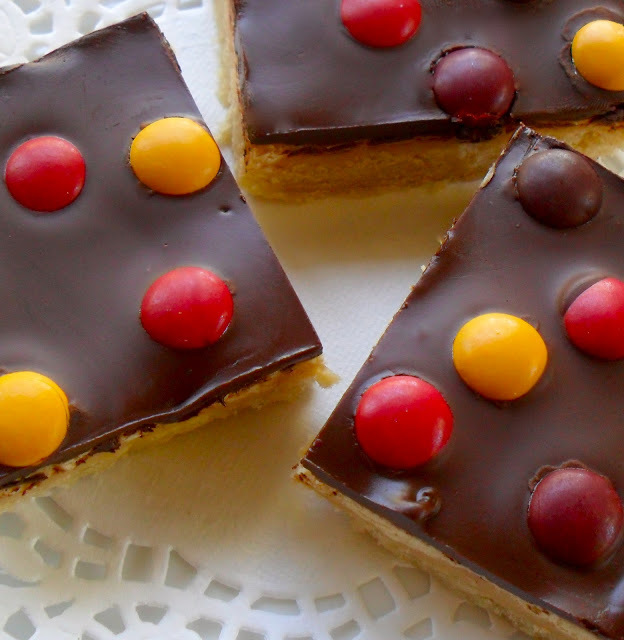 So the Fall colors grabbed my attention and I decided to make Millionaire’s Shortbread. Having seen them a few years ago on the FoodNetwork show, 5 Ingredient Fix, they were some of the first treats Alyson attempted to make on her own. They’re very simple: Shortbread baked, spread with caramel(cooked condensed milk), and covered with chocolate. If you want them to look all Fallish(apparently sooo not a real word), sprinkle with M&Ms. This is so not an advertisement for M&Ms. Preheat oven to 350 degrees. Line the bottom of a 8×8-inch pan with parchment or foil and set aside until ready to use. Using a food processor, pulse together flour, sugar, salt, and butter until crumbly. Add vanilla and process until dough just begins to form. Press dough evenly into the bottom of the lined pan and bake for 20 minutes. Place condensed milk and butter into a saucepan and cook on medium heat, stirring constantly, until mixture thickens into caramel and is light amber. (this should occur about 7 minutes after mixture begins to boil…watch and stir carefully to not burn or overcook.) Immediately stir in vanilla and work quickly and carefully to pour caramel atop the shortbread, spreading evenly. Heat chocolate and butter in a bowl atop simmering water until melted and completely blended. Pour over caramel later, tilting to cover completely. Sprinkle with M&Ms and allow to cool until chocolate has become solid. Cut into bars. « French Scrambled Eggs with Truffle Oil & Parmesan…Trying Exotic Ingredients On The Cheap! I’ve always wanted to make millionaire’s shortbread and don’t have any reason for not doing so. Love the addition of the M&Ms!